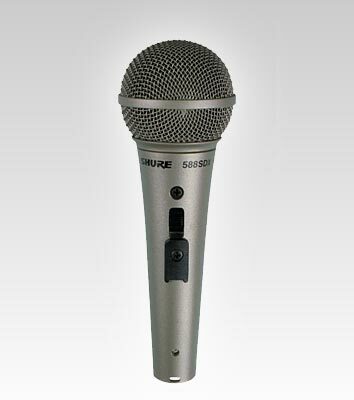 This microphone is highly suited for speech or music pickup in schools, churches, and meeting rooms. Its unidirectional polar pattern greatly reduces feedback problems, permitting operation closer than usual to loudspeakers without the annoying squeal or howl caused by feedback. The microphone is equipped with a lockable ON/OFF switch and an internal impedance selection socket located on the XLR connector for switching between high and low impedance. A slip-in swivel adapter is supplied for the convenience of stand-mounted use. 588SDX with swivel adapter and on-off switch. Cable not included.